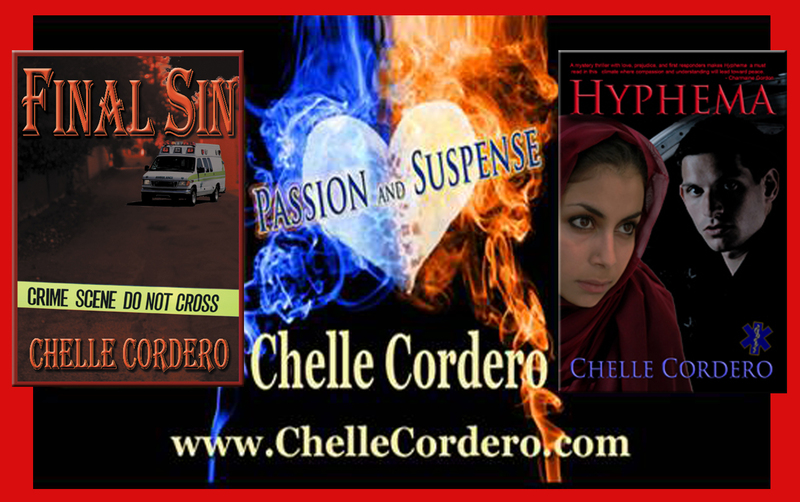 Chelle’s EMS novels Final Sin & Hyphema. “This is my first book by this author and I would read another one of her stories. This is Matt, Sudah and Raja’s story. Matt is white and his wife is Pakistani. Matt is a paramedic. Sudah is a stay-at-home mum who takes care of their son, Aden, but she wants to finish her education. The story is told mainly from Matt’s perspective and you can feel the love he has for his wife. Sudah appears to love her husband. She is a Muslim and very traditional in the way she treats Matt. She is very subservient to him although he does not require this from her. Sudah asks her husband if her cousin can come from Pakistani and live in their home with them so she can go back to school. Matt knows in his heart this is a mistake but because he loves his wife he says yes. Raja brings trouble to their happy marriage. In the meantime there is a deranged man seeking revenge against Matt. Every harassing activity perpetrated against Matt and his family makes everyone believe these events are happening because Sudah is a Pakistani and a Muslim; but nothing could be further from the truth. I read the book in one sitting; it was a page turner and I had to discover what happened in the end. I found the story to be an emotional roller-coaster ride because I did not believe that Sudah’s love for Matt was as deep and as unconditional as Matt’s love was for her. Even though there is a happy ending, I could not enjoy it because I thought Matt had been short changed by Sudah’s lack of trust in him. She believed Raja over her husband who had never given her any cause to ever doubt him. I was cheering for team Matt. What would have made this book a better read for me was to hear the story from Sudah’s perspective, as well, because it was very difficult to understand her reasoning at times. What else has been said about Hyphema? 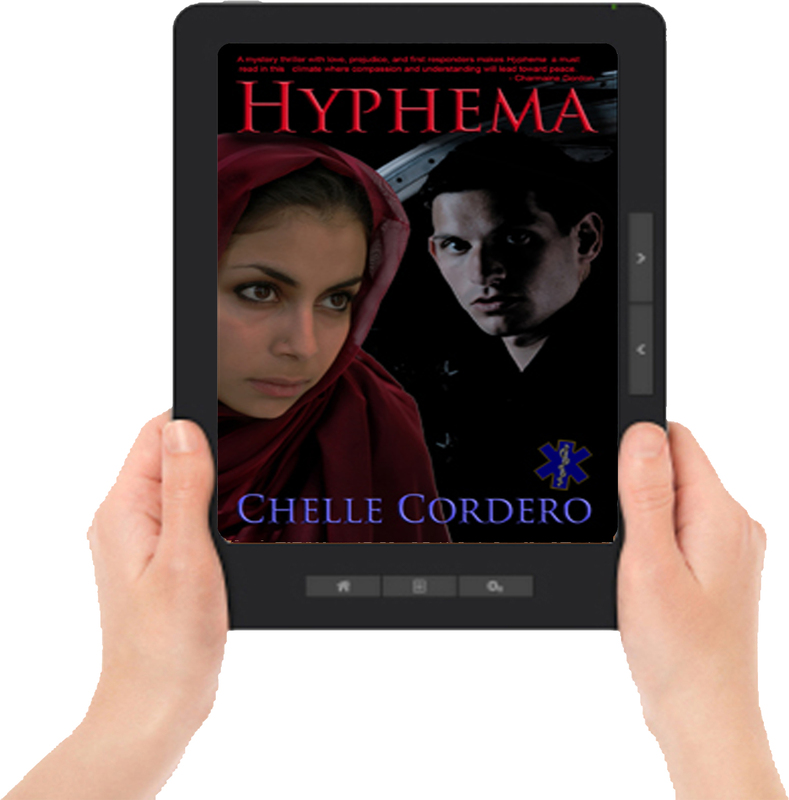 “I sat down to read Hyphema late one night. I thought I would start it, read for about thirty minutes and then go to sleep; instead, I stayed up till almost four in the morning reading it. Immediately immersed in the story, the tension never let up enough for me to even consider putting it down and coming back to it later. On one particularly heartbreaking call, Matt and his team are dispatched to a motor vehicle accident involving an SUV that had rolled over. The mother was unconscious, trapped in the car and her toddler son was bloody, unresponsive and pinned in the back in his car seat. To get to him they had to get the mother out. 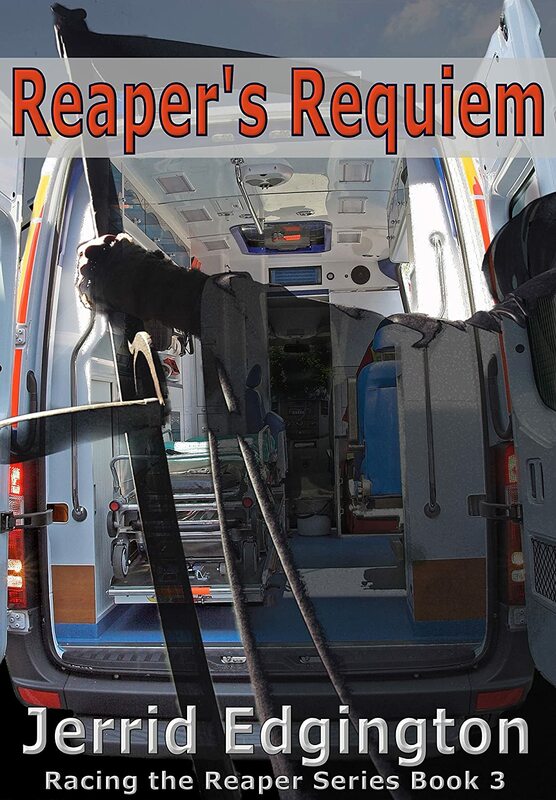 Knowing there was no time to wait for fire trucks and ambulances Matt and his team pry open the car door and get the mother out, but when they get to the little boy, they realize he is dead. Wanting to be able to tell the mother when she regains consciousness that they had done everything possible to save her son, Matt opens IVs wide and begins CPR on the boys still warm body, handing the CPR off to an EMT on board Matt goes to work on the mother, trying to stabilize her condition. Even though the team does everything they can the little boy is pronounced DOA at the hospital. His devastated father comes into the ER and discovers that his son is dead when he wasn’t even supposed to be with his wife, her sister was supposed to be babysitting. Overcome with grief he screams how he’ll make everyone pay. Life for Sudah is difficult at times, even though she is a happy person with an optimistic attitude. People won’t talk to her and sometimes call her names. Her own parents will not even recognize her marriage because it is a Muslim/Christian marriage. This is extremely hard on Sudah because she loves and misses her parents, but it becomes especially hard when they refuse to even accept a picture of their grandson because they view him as illegitimate. Sudah becomes the victim of apparent hate crimes; a rock is thrown through their window when she is home alone with a message that appears to relate to 9/11 on it. Another note is found taped to the house after the family had been away, every time they report the incidents and every time they police act as though there is simply little to nothing to do. After one particularly frightening incident the police even threaten to arrest Matt for filing a false report because they think he is making it up to make the police look bad – a task they are managing quite well on their own. 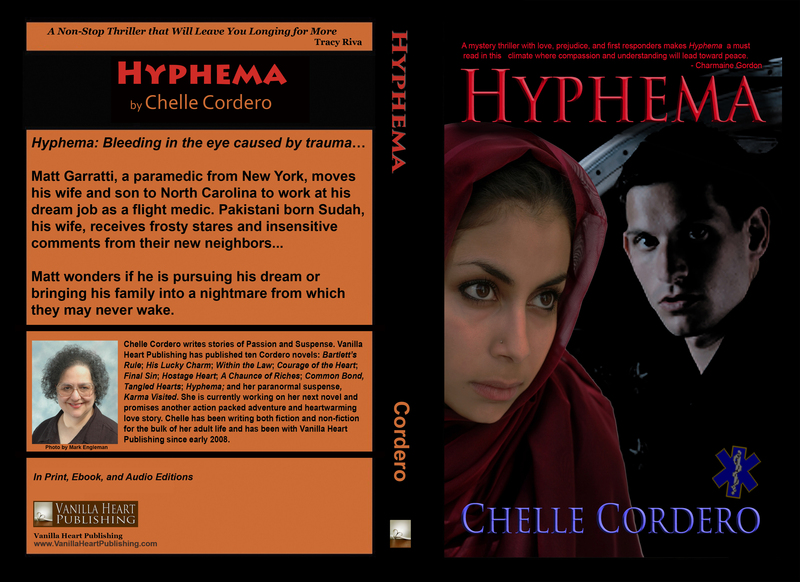 “Chelle Cordero tackles a difficult subject this time in her latest release HYPHEMA: bleeding in the eye caused by trauma. 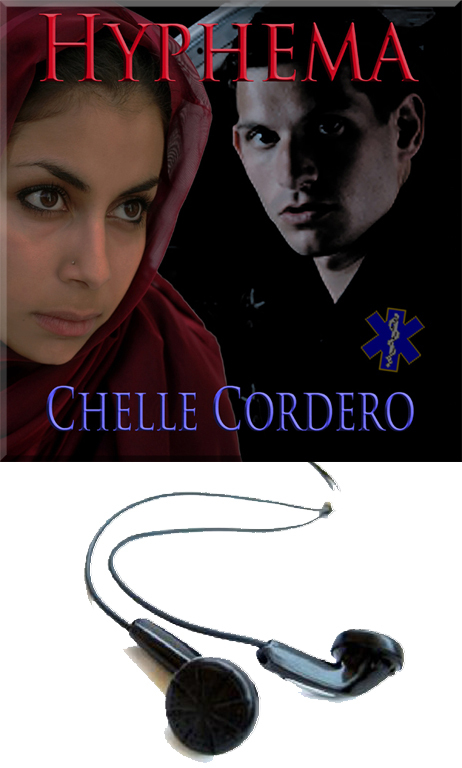 A mystery thriller with love, prejudice, and first responders makes HYPHEMA a must read in this climate where compassion and understanding will lead toward peace. This call had gone out over the radio for a burn victim, so none of the responding police, fire fighters, volunteer ambulance crew nor paramedics were prepared for what they found when they reached this isolated tool shed. From the outside, the grayed wood had seemed serene enough, and the one small window had been caked over with dirt. She didn’t think that she would have given the shed a second glance under normal circumstances. But this was far from normal. No one had anticipated the horror scene inside. Each year, about 600,000 Americans – one in four — in the United States die from heart disease, according to the Centers for Disease Control. A United States Air Force Veteran and Career Firefighter Paramedic, Hemstalk has been providing emergency care for over 20 years. During his tenure in EMS, Hemstalk has been an educator, Paramedic Preceptor and Field Training Officer. Working for government agencies and private companies alike, Hemstalk relies on his experiences to help design product features that improve efficiency, speed and accuracy while keeping the field provider’s needs his highest priority. Joining Forte Holdings’ team was a natural progression combining his love of the Emergency Medical Services industry and new technology along with his commitment to providing the best possible documentation on each and every call for service. To stay current in the industry, Hemstalk remains active in EMS, is still a full time Firefighter/Paramedic and continues his passion for treating those in need.